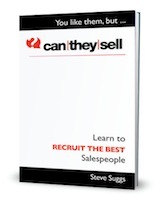 Learn...WHERE to find the best salespeople to interview. WHAT to look for when interviewing. HOW to look for traits and skills. Secrets of great interviewers. After years of study and practical application, I have discovered a "best practice" recruiting system that answers the question, "Can They Sell?" This system is tied to the knowledge of human behavior, which, when used in recruiting, then becomes the foundation for coaching the members of your sales team. In this book, you will find a process with tools and skills needed for selecting the best from the rest. 1. Only one of your last three recruits lasted a year. You're frustrated - they looked good and sounded good - but they couldn't sell.